You are wise to stick with Godet and I will probably NEVER be able to prove that these were a real wartime wearing copy (they are certainly NOT a presentation set). After knowing where these were for the last 30 years, and knowing the person who acquired them (a very old friend), I traded for them last month. They came from a vet, but that means nothing today without better information and documentation. I, too, will never be able to buy a Godet set, so, in the meantime, these will serve. If they are fake, someone went to a lot of trouble for very little reward. In hand, the quality is outstanding. http://gmic.co.uk/uploads/monthly_02_2009/post-2778-1235238653.jpgUpper right eagle (sequence is repeated on other 2). http://gmic.co.uk/uploads/monthly_02_2009/post-2778-1235239037.jpgAnother Order, 1939 (1 month apart from first posted). http://gmic.co.uk/uploads/monthly_02_2009/post-2778-1235241074.jpgNext 0f Kin case (from Niemann). http://gmic.co.uk/uploads/monthly_02_2009/post-2778-1235241657.jpgSouvenir board from S&L supposedly brought back by British officer immediately postwar. "Drop-tail" eagle variant at lower right of Spanish Crosses. I can't believe these drop tail eagles crosses original. these eagles are particularly crude. look at the difference between your last two Steinhauer. the first, which I guess original has the typical Steinhauer eagle, the second has drop tail eagles; why Steinhauer should have made so ugly eagles at the middle to the end of the war instead of the previous ones ? you can see the soldering at the top of the wings on your second cross. I don't have it in hands, but could it be possible that fake eagles could have been soldered to an original base? Concerning Doehle images, they are drawings and not pictures. Except very few crosses, like the one you shown, all the drop tail eagles crosses shown typical fake construction (pin, hinge, hook, swords gips, etc..), this why I don't think they are war period, but much more post-war made. May be some were made very early after the war, using original base stocks, as souvenirs for GI's; and the others are 70's-80's fakes. I've no proof, it is just deduction, logic, and feeling; so this statement only engage myself. I prefer to avoid these drop tail eagles crosses and I consider them as fakes or post-war made. 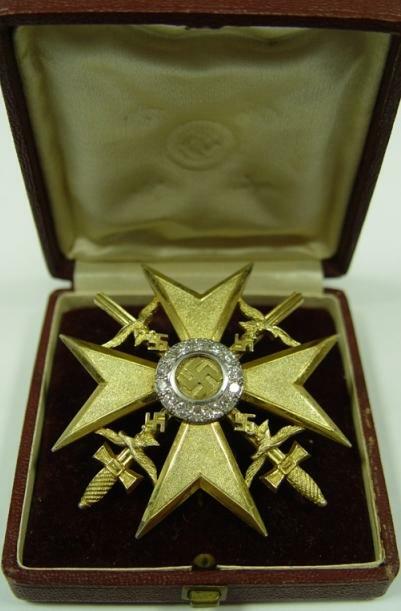 here is a picure shared by CHE, and it is one of the cross with diamonds I consider original. Except for multiple reported "vet bringbacks" of "drop-tailed" eagle Spanish Crosses, the foregoing posts constitute all the evidence I am aware of regarding the possible existence of these variants. They have been discussed repeatedly (but almost always viciously) in other forums. 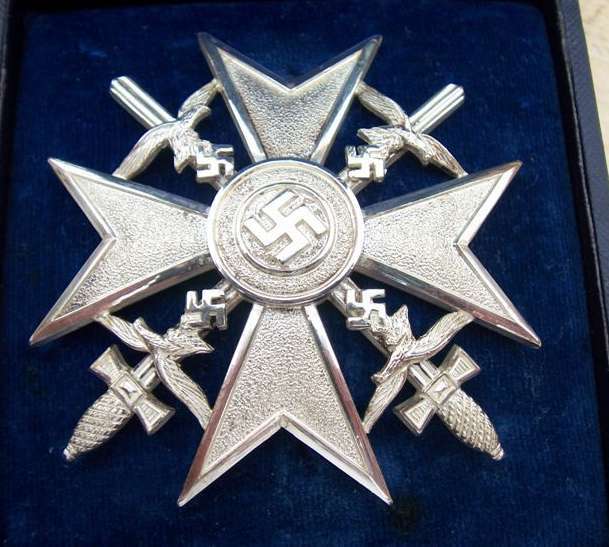 It is my PROPOSAL that drop-tailed eagle Spanish Crosses constituted a "jumping of the gun" by some manufacturers who believed the Luftwaffe eagle used in 1936 would be the one used on the awards, based, perhaps, on confusing official designs. It MAY even have been that the design started off as "drop-tail", progressed to "alternating eagles" of each type, and then settled on the final "swoop-tail" version (adopted by the Luftwaffe in 1937, and transitioned in on uniforms over the next 2 years) seen on almost all awards, all in a very short time span. 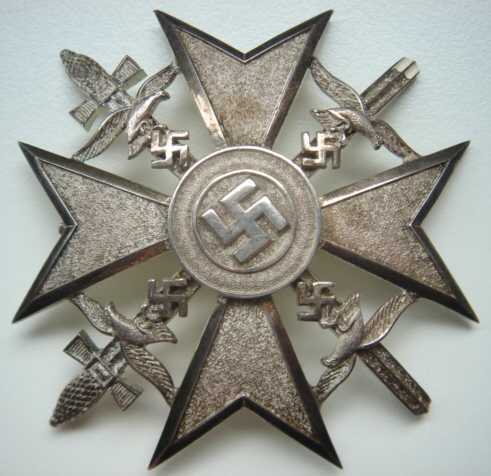 There are certainly multiple postwar fakes of the Spanish Cross using the "drop-tail" design. ALL of these fakes, in my personal observation, lack the quality of wartime pieces and, indeed, many are sloppy castings. At this point, NONE of this can be proved absolutely and there are no photographs discovered so far which are clear enough to definitively establish that a cross being worn is of the "drop-tail" variety (although some are close). P.S. Jacques - I understand fully your feeling and appreciate it. I will post photos of two different eagles, with the suggestion that they are not crude or ugly. By the way, the last several posts are NOT my photos or of items I have. http://gmic.co.uk/uploads/monthly_02_2009/post-2778-1235243222.jpgFrom the "brilliants" set. The design of this eagle IS different from the silver one just posted. Silver "L/52" and no marker. Jacques, Harrier, What is your opinion about the droop-tail eagles on the case top for the next-of-kin medal? the Spanish cross was instituted on April 14th, 1939, and the crosses were awarded from May 31st to 4th June. Very few manufacturers were involved in this first serie (Juncker, Meybauer, Deumer, Godet, Steinhauer), the other manufacturers IMO intervened later for private market/purchase. This bunch of manufacturers had to make around 25000 crosses in a short time ! In 1939, the last form of the LW eagle was already used on uniforms and caps, so no logical reason to choose the old pattern design. Your Steinhauer cross is marked "4"; this mark was used after 1941 by the firm, and not for the early production. Attached is a period german magazine page presenting LC medals. At least , it is an interesting discussion. I hope more collectors will come. Isonzo,very nice crosses. the second one looks mint ! could you share the reverse ?